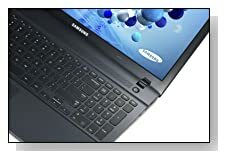 The Mineral ash black ATIV Book 2 NP270E5J-K01US is a new 15.6 portable laptop computer by Samsung. “ATIV” is the reversal of “VITA” which means “life” in Italian and the name is now used for all of its personal computers of the company. While offering portability at less than 5 lbs weight and 1.25 inch thickness, its doesn’t sacrifice performance with its Haswell i5 processor and 8GB system memory. Samsung ATIV Book 2 has a fourth generation Intel Core i5-4200U (3MB L3 Cache) at 1.60GHz base speed (up to 2.60 GHz with Intel Turbo Boost 2.0) that offers good efficiency, speed and performance although it is a processor for ultrabooks focusing more on energy efficiency and better battery life than desktop power to make it a powerhouse of some kind but it has the Hyperthreading function so it allows smart four way processing of dual cores, 8GB DDR3L SDRAM to be able to process multiple applications without delays or freezing, 1TB SATA HDD at 5400rpm for lots of regular and multimedia files- music, movies and photos and the 64-bit version of Windows 8.1 operating system offering better user experience with extra features such as the new Start button and it allows you to boot to the traditional desktop screen of Windows 7 rather than the Windows 8 tiles. 15.6 inch anti-glare LED backlit widescreen display (16:9 cinematic aspect ratio) with 1366 x 768 pixel resolution, 220-nit brightness (to use comfortably in well lit rooms or outdoors) and Intel HD Graphics 4400 (better graphics performance than the standard Intel HD 4000 but not as good as a dedicated graphics card if you’re intending to play the advanced games at higher settings) offering crisp image quality letting you see fine details and smooth motion when you’re playing 720p video playback, editing content and playing current games. Keep in mind this is a non-touch screen, if you’re looking for the touch function. SoundAlive technology and the integrated stereo speakers (2 x 1.5W) give you loud and clear enough sound when you’re chatting on Skype with its HD webcam, listening to songs or watching movies. You can always use the HDMI port to connect to your HDTV to view your laptop screen on a larger screen. It also comes with a VGA port, DVD +/-RW Super Multi Dual Layer, a 3-in-1 Media card reader, 802.11b/g/n Wi-Fi, Gigabit Ethernet with RJ 45 port, Bluetooth 4.0, 3 x USB 2.0 ports, Security lock slot and a webcam with built-in microphone. The 6-cell lithium ion 4400mAh battery offers more than five hours of battery life in average daily use. 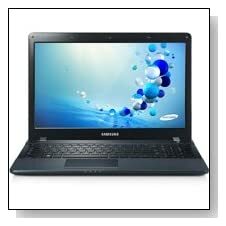 Mineral Ash Black Samsung ATIV Book 2 weighs 4.85 pounds with measurements of 14.80 x 1.25 x 9.76 inches. So both the compact size and more than average battery life allow portability. Keyboard is full size and ergonomic for more accurate typing with 10-key numpad and black spaced-out keys. Thanks to Samsung SideSync the laptop and your smart phone sync together- please see the video above for more info). Conclusion: Samsung ATIV Book 2 NP270E5J-K01US is a good value for money ‘entry to mid-range’ computer with its Haswell i5 processor, 8GB RAM and 1TB hard drive. What is interestingly missing on it is a USB 3.0 port that would allow much quicker data transfers than the USB 2.0 but pretty much all the other necessary connectivity options are covered, including a DVD drive and Bluetooth connectivity. If you’d like to improve its overall performance and boot up faster, just get a Solid State Drive and use the HDD as an external drive. It looks aluminium with its mineral ash black colour but in fact is made of solid plastic- not sure if you can get an aluminium laptop at this price range though. It is suitable for using at home, school or work for both fun and work and presents good value for dollar overall.